Traditional Style Aikido Hakama made of 100% Cotton. Grade #10,000 100% cotton threads were first dyed using the Shoaizome process, prior to the fabrication of the fabric. Long lasting quality. This is one of the the best quality 100% Cotton Hakama you will ever find. Many improvements have been made on this Hakama. The inner folds are stitched to keep the folds always neat. The Himo (tie strings) have extra padding for extra confort and strength. The sides of the Hakama is made a a little longer than the center, in order to give a beautiful straight line, when standing. See the picture above for the details on the Inner folds. This feature is unique to e-bogu Hakamas and helps preserving the beautiful shape of the Hakama. 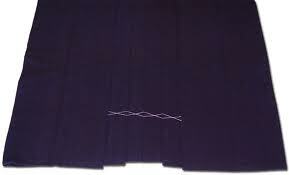 Picture above shows the length of the sides being longer than the center of the Hakama. This is unique to e-bogu Hakamas and creates a beautiful line when standing up. Thank you so much for great craftsmanship! The katakana embroidery is beautiful and delivery took much less than expected. I will be sure to order again from e-bogu! The stitching is top quality. 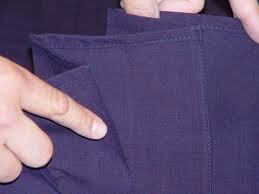 You will need to wash the Hakama 3-4 times before using it - the blue dye will bleed on to your white gee. I’ve been wearing this #10,000 Shoaizome hakama for a month now. It was a super deal in the Sale Outlet section because it was a size 30 (6’6”-6’8”), as I am 5’8” I had to trim 4.5” and re-hem by hand. Fits great, feels great, I don’t get my feet caught as I did with my tetron hakama because it holds its shape better during practice and even though it is heavier it feels cooler. Care instructions say don’t but I machine-washed and dried it in boiling water twice hoping it would shrink. I do not recommend you do this but it did shrink 1”, it also stained my dryer. It washed a lot of the extra dye off but it still retained its color and only bleeds a little onto my gi now. The himo is wider and more padded so it is easier to push through my obi without it rolling up. I recommend this hakama to anyone, but I also wear a double weave gi in Phoenix summers. I will by another #10,000 hakama from e-bogu when this one wears out. Thank you e-bogu, great service and product as always.